One of my mother’s friends said this to me the morning after we threw a surprise 60th birthday party for my mother. In a blizzard. Of course, we couldn’t have predicted the weather. In fact, Dad was sure that we were really over reacting to the weather reports. “It’s not going to be that bad,” he tried to whisper to us when mom was in another room. But as the time for the party drew nearer, even he wondered if people would come. Our plan was this: tell Mom we were going to a prix-fixe dinner they were having at the banquet hall next door to the restaurant where we usually had a family meal during the holidays. The problem: Mom wanted to stay home and cook Beef Wellington. Well, she couldn’t really do that because dad refused to buy the beef – said it was too expensive this year. So Mom, ever the diplomat in the family, begrudgingly agreed to go. “I’m going to meet a friend at the bar for a drink before dinner – I’ll meet you there,” said my sister Meg. She did meet her friend. For a drink. At a bar. But it happened to be the open bar for our party. And the drink was had after she set up the projector and speakers for the slide show put together by another sister and brother-in-law. I, too, was to meet my family there. When I arrived, the events planner was stunned at the number of people who had already shown up for the party. She told me, “but as I watched people taking off their coats, just about everybody said, ‘well, of course we’d come out for Jeanne. '” Yes, we threw a party during the first major snowstorm of the season and only three people canceled due to the weather. I don’t know that a successful life is measured by the numbers. But if it’s measured by what your friends and family will do for you, then my mom has surely had a most successful life indeed. I find it fascinating that God sends the same messages to me over and over again – because they’re that good, and worth being reminded of. I’m also impressed with his ability to send messages to me in so many forms – in the words of others, in the words of a song, in a conversation I overhear while standing in line at the coffee shop. This time his words came through a friend. And though he was talking about himself, I notice the same thing in my life. “It seems if I let one thing slip, then everything else starts falling apart, too,” he said. I think it important to find and know the things that “keep you going.” I’ve written here before about what some of those things are for me. But here’s the thing: Most of those things that keep me going have fallen by the wayside in the last couple months. Surprisingly, though, I’m not on the floor in a fetal position crying my eyes out (which has definitely happened before). In fact, I’m quite enjoying the few weeks I have “off” between semesters. And find it odd that I’m not falling apart at the moment. Not that I’m complaining. But it prompts me to wonder what it is that is keeping me up? Is it the 29 Gifts? Is it the free feeling I’m getting by getting rid of so much of my “stuff”? Is it that I’m just so very much looking forward to moving to NC in July? Or to my Caribbean trip in two weeks? There is something to be said for finding out the “secret formula” that makes you feel good about how you’re living your life. The catch? The formula for a happy life is different for every one of us. Some of us never find out what the formula is. Some of us never even try. 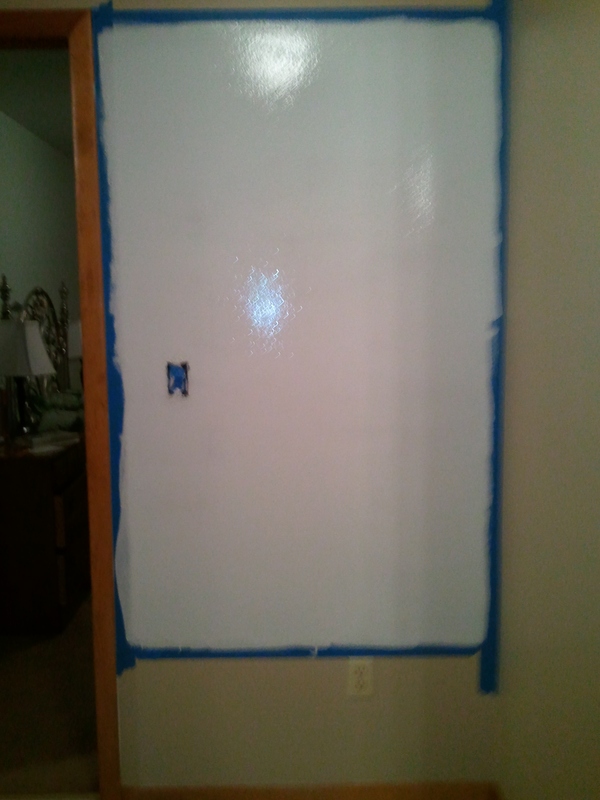 I can write on my walls! One of my students had an issue with his homework. The issue? He never did it. It was eventually decided that a call home was needed. Oh how I dreaded that. But thankfully, his father was very appreciative. “He’s always been an A student, so we never had to check on his homework,” he explained. “We were surprised when he got a B first quarter in your class.” I explained how homework is the practice students need in order for the material to move from short-term to long-term memory – and that’s why he did poorly on his tests. The father promised to take away some privileges and keep on top of him. Well, it worked. Since that conversation two weeks ago, he’s had his homework in on time every day. So I called dad to tell him what a good job his son was doing. Then, I walked in today to find him with an excuse as to why last night’s homework wasn’t in my basket. Ugh. Just when I thought it was getting better. He swears he had it earlier. Two classmates attest to this fact. But he can’t seem to find it. “I’ll reprint the worksheet for you and you can do it at recess,” I said. When recess came, he came into my classroom to do his work. Normally if the work isn’t in on time, it’s a zero. But today I gave him a gift. “I believe you when you say you had it,” I say. “So I’m not going to give you a zero as long as you turn it in by the end of recess.” “Thank you,” he said. As he worked, he stopped once in a while to chat with me about random thoughts that crossed his mind. “My sister took this course and she said it made high school a lot easier.” “Oh, really?” I said, hoping he’d continue. “Yeah – so I’m glad I’m taking it now.” Did he really just say that? The student who complained the first two months that he didn’t want to be in this class? The one who said he wasn’t good enough to be in this advanced course? I had noticed a turn in him the last couple weeks and it was amazing to watch. That afternoon, he found his homework. He had put it in the wrong section of his binder. Organizational skills is one of the topics we’re working on, so I’m just happy it was in his binder. And thankful that by believing him and beliving in him, he’s come to believe in himself. To see what other gifts I’ve given as part of the 29 Gifts project and to read about others doing the project, click here. When I first told my parents of my idea to sell my couch my father said, “Oh – so you’re going to get a new one?” “No,” I said. “Well what will you do for a couch?” he asked. “I don’t really need one. I don’t have a lot of visitors. And I’ve got enough chairs.” He just shook his head. I think it’s hard for him to adjust to the fact that his “pride and joy” is becoming so unusual by his standards. I like to think I’m expanding his horizons. As it is, I’ve converted him to be a lover of craigslist. I don’t know that my parents will ever host a couchsurfer, but hey – a little at a time. So today I finally did it. 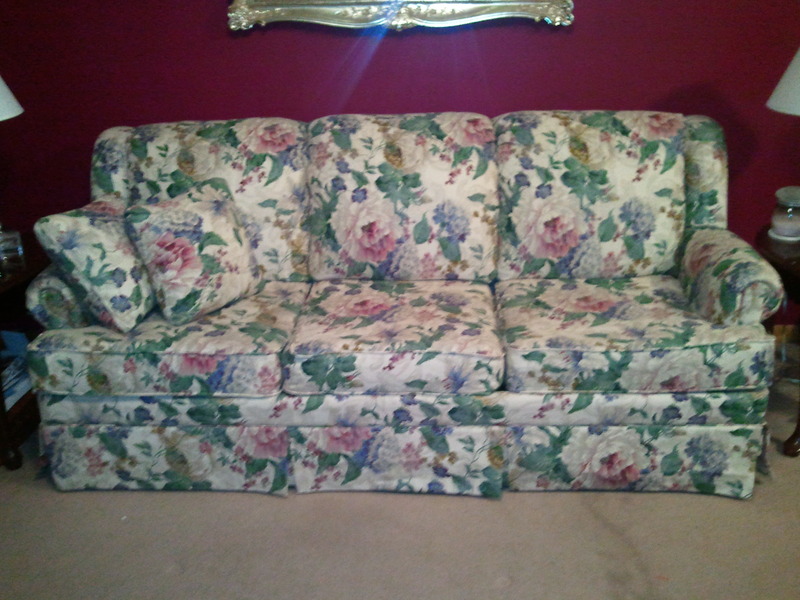 I cleared off my couch long enough to get a picture of it, then posted the ad on craigslist. Wow, does that feel good! I love getting rid of things. I’ve dropped off things at the new consignment shop in town twice already and it’s only been open for two weeks. But you know what made me laugh today? The fact that I say I’m selling all my stuff to fund world travels. Because honestly, I already have the money I’d need to take off. One is not dependent on the other – but they are connected. I’ve wanted to pare down for quite some time, but not until recently did I have a definitive plan and deadline. “Plan? Deadline?” you ask. Well, kind of. I’m moving to the John C. Campbell Folk School on July 30,2011. So my goal is to be pared down by then. I’m thinking of going to Italy for a few weeks before that, so I might move up my deadline. After I finish my term at JCCFS, I have some ideas, but nothing definitive yet. My plan is to head for warmer locales in the states for January, February, and maybe March. Then head off to Italy for a spell. Maybe tend to the grape vines, or lemon trees or something like that. Once I get the hang of living simply in a place where life still has “modern amenities,” I’ll venture out to places a bit more out of my comfort zone. “But maybe when you come back you’ll want it – but it might be too expensive to buy another one,” said my youngest sister. She was talking about the regrets I might have if I sold my piano in my effort to fund a year of traveling. I’d heard the argument before. From my mother. And my father. And my former piano teacher. But honestly, I can count on one hand the number of times I’ve played it in the last year. And have played it maybe 20 times, if that, in the last three years. Probably less. In fact, I think I played piano more when I didn’t own one. Why is everyone else attached to the idea of my piano more than I am? My youngest sister compared it to getting rid of her riding gear even though she no longer owns a horse – she just couldn’t do it. But she only got rid of her horse a year ago. I stopped playing piano with any regularity at least five years ago. Yes, I may come back from my travels and wish I still had it. But I doubt it. And if so, well, then it’s my own fault. And I’ll just have to start saving for another one. I told my youngest sister that I’d still consider giving it on long-term loan to someone. Maybe it would be a nice rental piece – a hundred a month I told her. “But if you can’t find anyone to do that, would you still just give it to someone while you’re gone?” “I guess so.” “Ok. Good. I’ll put out the word and find someone.” I don’t know. That doesn’t feel right either. What feels right is to sell those things I haven’t used in a while – and the piano definitely qualifies. So I’m on Day 5 of the 29 Gifts challenge. If you want to read about the gifts I’ve given so far, you can click here.